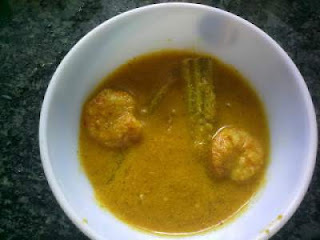 Rice-prawn fish curry is a very famous combo in Goa.Prawn curry with drum-sticks gives it a unique taste and flavour which just cannot be described.. :)There are other variations of prawn curry too which I shall post sometime later..till then you can try and enjoy this one. Wash the prawns well and apply salt. Grind the following to make a fine paste - grated coconut,haldi powder,red chillies,tamarind pulp,coriander and pepper seeds. Chop the onion.Peel the outer skin of the drumsticks and cut them to finger-size sticks. Add onion to the pan and saute. Put in the prawns and drumsticks and add sufficient water so that the drum-sticks and prawn cook. Once done add the ground paste and salt as per taste. Add a pinch of hing to this.